I grew up influenced by gardening and nature. Picking elderberries with my Grandma. Visiting the annual village country show (with all the humongous homegrown veggies) with my Grandad. Plus many happy weekends in the garden with my family growing plants, digging ponds, and building the biggest piles of leaves. No doubt these experiences have fostered my love of the outdoors and appreciation for nature. And I want to give my own children the same appreciation and respect for nature. I know a lot of friends who don’t have the space for gardening outside though. But that’s okay there are loads of options that people can do to help them grow things inside. For example, you could start using an LED grow light to help (if this is something that interests you then you can check out something like this source: 420proguide.com/best-led-grow-lights/). Children are naturally curious. In addition, they have boundless energy and love to get dirty (well, mine do!) Getting out in the garden is a perfect opportunity to help your children learn whilst having fun. From a young age they can experience the satisfaction of growing their own food and flowers whilst developing an understanding of nature and growing environmental awareness. Composting is a great way to show the whole life cycle to children; soil to food and back to soil again. 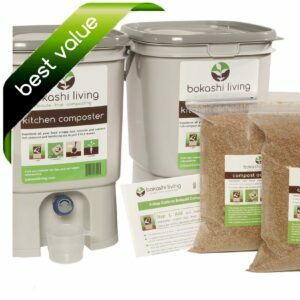 Composting also teaches children the importance of every living thing, even the bugs and microbes that they may not even know are there. 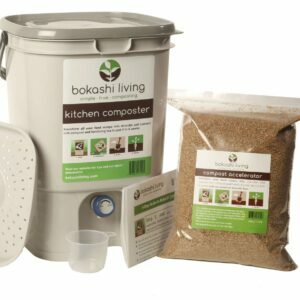 My children love the bokashi composting process as it is fast, easy and happens right in our kitchen. Growing your own food is a great way to foster healthy eating habits. Fruits and vegetables always taste so much better straight off the plant! By seeing fruits and vegetables growing, children gain a real sense of where their food comes from. These are lessons that are important for their whole lives, and for future generations. Fresh air and exercise are critical for children (well, for us all!) Whether its climbing trees, making mud pies, raking leaves or playing hide and seek; this is time well spent. Gardening and the great outdoors are fantastic ways to strengthen our children both physically and mentally. Another way that parents are helping their children do more exercise is investing in getting some Tennis Lessons, this means that they are having someone make sure that they are getting the proper amount of exercise and they are learning a new skill as well. 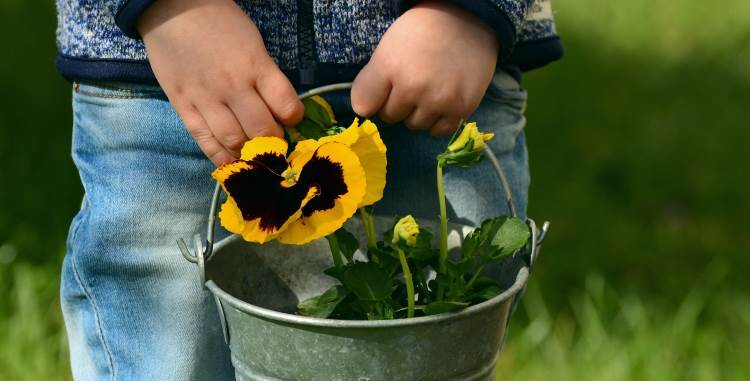 Gardening is a fantastic activity that all generations can enjoy. Digging in the dirt, catching bugs, running through the leaves, the excitement of digging up the first root of potatoes… all simple pleasures that every child (and big-kid!) enjoys. So turn off the phone, unplug the TV and find your rainboots. Gardening is not guaranteed. There will be failures (another great life lesson for young gardeners!). Below is a list of top 10 things to grow with children. This is a great starting point for all gardeners, young and old alike. First and foremost, grow things that they like to eat. None of my children are particularly keen on lettuce, cress or radishes, so even though they are simple and quick, they didn’t make my final top 10. Strawberries are really simple to grow. Not many of my strawberries make it into the house as most are consumed as snacks in the garden. 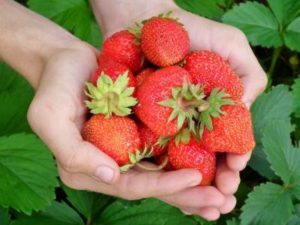 Strawberries give a great opportunity to teach your children about the importance of pollination. Strawberry plants are super easy to grow and propagate. Collect and pot on some of the runners to replace any old plants or share the strawberry growing fun with friends and neighbors. Potatoes are also quick and easy to grow. Children can help every step of the way from choosing the potatoes to chit all the way through to scrubbing the newly dug potatoes. Potatoes are great for young children to water (potatoes love water) and earth up (another excuse to get dirty!). The look of amazement on a child’s face as you dig up the first root is priceless. Children love getting down on all fours to scour the soil for every last potato. Climbing beans are fast and easy to grow. Many children don’t like the ‘hairy’ skins of runner beans so I would suggest choosing a smooth skinned bean variety of french beans. Pick beans regularly to encourage a continuous supply of beans. Again, beans are easy to collect at the end of the season to grow again the next year. Sweet cherry tomatoes are another great option for children. The seedlings are small and delicate, therefore children may need help tending and transplanting them. Alternatively, you can often get healthy starter plants from your local garden centre. Cherry tomatoes are a great way to teach children the importance of pollinators. Watch the flowers turn to small green tomatoes and marvel at the magic of the sun turning the tomatoes into sweet red fruits. Choose a tall variety and see who can grow the tallest sunflower! Follow obligatory photo of sunflowers towering over your children’s head. At the end of the growing season the seed heads are great bird feeders. Win, win. Zucchinis are another quick and easy vegetable for children and novice gardeners. They are simple to grow from seeds and produce fairly large seedlings that are relatively easy for children to handle. The flowers are edible and my children love to eat the small, young zucchinis straight off the plants (uncooked). Alternatively, slice into thick slices and cook on the barbecue. Or be sneaky and turn them into a chocolate cake (there are loads of recipes if you google). Your children will love that they ‘grew’ a cake! Nasturtiums are quick and easy to grow. They produce a mass of large leaves and brightly colored flowers. The leaves and flowers are both edible (although the flowers can be a bit peppery for some children’s palette). Once again, the seeds are easy to collect and sow again year after year. If you collect the seeds whilst still green, these can be pickled and used in a similar way to capers (not to many children’s taste). Corn needs a but more space and time than a lot of the suggestions above, but freshly picked sweetcorn is a win for most children. If you’ve got space this is a relatively easy and fun vegetable to grow. A great place to start with children is sprouting beans on the windowsill. These are super quick and take very little care. Just soak overnight and then rinse once or twice a day. Within a few days you have sprouted seeds ready to eat. Peas and mung beans are favorites with my children. A great option for growing all year round. Don’t worry if it goes wrong, learn together. Nothing is guaranteed in gardening. Just take any failures as a life lesson and move on. And remember, just because it didn’t work the first time, doesn’t mean that it won’t work next time! If you’ve spent time with children you will know the importance of making things fun. Silly songs to get them to tidy up their toys. Races to get them dressed in the morning. The same is true with gardening. Remember, some jobs may be unsuitable for young children (even older children may not have the patience for some tasks). It’s perfectly OK for you to help out behind the scenes; moving the sprinkler, potting on seedlings, or weeding. And they don’t need to be told every time you help them out. Gardens are muddy places. Mud plus children will cause mess. Find old clothes that you don’t mind if they get muddy. Lots of studies have shown that exposure to mud and bacteria is good for developing strong immune systems so embrace the mud, bugs and grime! Gardening with children (particularly young children) is going to cause mishaps. Plants are going to get trodden on. Seeds are going to get spilled. Make sure you clearly mark any areas that have seed or young plants on them. Covering with netting is a good way of clearly showing children where not to walk. If you have space, give your children an area of the garden for themselves to dig in, where there is no risk of damaging plants or disturbing newly sown seeds. Be flexible with your time outside. Maybe they don’t want to help weed the vegetable bed all morning, and would rather collect worms or build a mud pie. Don’t worry. Better still…. join in! This is so important I’m going to include it twice. If you want to foster a lifelong love of the outdoors and gardening, it has to be something that they want to do. If gardening starts to feel like a chore and stops being fun…. then your children are less likely to stick at it. ← Over 310,000 lbs of new, fertile soil!